A multiplicity of authorities is a major problem in metropolitan cities. Cities in India are governed by multiple organisations and authorities which have their own jurisdictions; thus Indian cities are characterised by multiple boundaries. The governing authorities in a city include urban local bodies (ULB) with the primary functions of service delivery, planning for socio-economic development and regulation of development. This results in their subdivision into different wards. Large cities also have development authorities, urban development authorities or improvement trusts responsible for planning and development that divide cities into various planning zones. Line departments, that is sector-specific organisations, deal with the provision of services in their respective sectors — the water supply agency has its own supply zones. Sewage disposal is also done based on various zones. The organisations responsible for safety and security delineate another set of zones. None of these zones is coterminus, generating a ‘maze of boundaries’. Since planning aims at achieving a shared vision, the different spatial entities of the city formed by non-coterminus boundaries deter effective planning and good governance. Until 2012, Delhi was governed by three municipal corporations — the Municipal Corporation of Delhi (MCD), the New Delhi Municipal Council (NDMC) and the Delhi Cantonment Board. In 2012, the MCD area was divided into three municipal corporations — the North Delhi Municipal Corporation, the South Delhi Municipal Corporation and the East Delhi Municipal Corporation. Thus the NCT is governed by five bodies. The Delhi Jal Board, the authority responsible for water and sewage management within the jurisdiction of the NCT, has delineated 11 zones. The Delhi Police looks after the safety and security of 13 districts. The Delhi Traffic Police has divided the NCT into 11 districts, which are subdivided into 53 traffic circles. The multiple boundaries of jurisdictions of all these governing bodies and their spatial non-alignment and non-coherence further reinstates the argument of a ‘maze of boundaries’. A minimum organisational set-up is suggested to bring the multiple agencies on a common platform to determine a metropolitan-wide strategy for planning and implementation. Singapore, with its planning boundaries and smart urban development, is a good example. The urban planning boundaries of Singapore were first delineated by the Urban Redevelopment Authority (URA) in the 1991 Concept Plan. It comprised 55 planning areas organised into five planning regions, namely, the central, west, north, north-east and east regions. The 2014 master plan retains the five planning regions and 55 areas which are further divided into smaller subzones. The fact to be noted is that since the implementation of these boundaries, other departments have also adopted them for their administrative purposes. The unified boundaries of the various forces in planning and coordinated efforts have contributed to the planned and smart urban development of Singapore. In India, the Smart Cities Mission, an initiative meant to drive economic growth and improve the quality of life of people, calls for appropriate local spatial development plans. However, a multiplicity of boundaries is a deterrent for proper planning efforts and good governance. The existing maze of boundaries needs to be revamped for more coherent and integrated planning and governance. Discuss how multiplicity of authorities in Indian cities mainly metropolitan areas hinders planned and smart urban development. It has been a year since Kashmir turned on its head and went on the path of self-destruction ostensibly under a new leadership and new foot soldiers. Burhan Wani’s death, in an encounter on July 8, 2016, led to the outpouring of emotions which got converted to extreme violence and led to a change in the nature of the conflict. 2011-2013: Was the peaceful period. 2008-2010: The separatists attempted a strategy of combining terror and street turbulence to make their struggle more relevant. 2011-2013 : was a recovery time which the Indian establishment failed to cash-in on despite its default actions of changed strategy of outreach and engagement, and the interlocutors’ genuine attempt at discerning the aspirations and seeking the path of compromise. The ray of hope created in the people, especially the youth, did not find matching energy or a sense of commitment and continuity in the establishment. The demand by the state government to do away with the AFSPA and the contestation by the army only helped create wrong narratives and took the focus away from the emerging situation. Drift was the order of the day. It is this drift and the dashing of hope of the people that led to the rise of Burhan Wani and the renewed romanticism with the gun. It was brushed aside as an isolated resurgence among renegades but the groundswell of support eluded our assessment. The engagement with the people once again became transactional, providing the window that was needed by the separatists to energise the movement. Pakistan started focusing on the Jammu sector because it was easier to infiltrate and execute actions there in a single night. It may be an important lessons to note that the new militancy characterised by the presence of social media-wielding youth was little understood by the establishment, intelligence agencies and the media. Their assessments were archaic and based on assumed beliefs. The youth were building a new narrative of resistance through social media outreach. The state was observing this but did little to launch an effective counter in the domain that mattered — social media or any form of communication to the public. Social media, ideology and religion are the last things that the security establishment understands because it involves rebooting, relearning, mastering technology and most importantly, getting to know the religious underpinnings of the time. With their typical tenure-based approach to problem solving, the security establishment does not display the capability to assess intellectually or learn nuances beyond the ordinary response involving gun-on-gun. Intelligence agencies have a better measure of institutional continuity but lack the means of persuasion to convince and thereby alter understanding and planning. The army always laid great stress on North Kashmir. This was quite natural with three of its major formation headquarters located there and the task of counter infiltration based on LoC deployment which is essentially army-oriented. By contrast, South Kashmir had only a single Rashtriya Rifles (RR)) force headquarters but it had Pulwama, Shopian, Anantnag and Pampore, all trouble spots where the better educated youth reside. Absence of or lower level of military achievements does not mean normality. It is the social parameters that need to be viewed. The virtual denudation of the southern belt below Shopian Kulgam and the overall inadequacy of troops in the south allowed local militancy to bloom. When it did, we fought it in the physical domain while it was actually flowering in the virtual and psychological domain. The deployment of all forces must be more balanced and no premature withdrawal should be executed on the basis of statistical inputs. The fight in the psychological domain can no longer be ignored. This needs an approach beyond what the army has provided; the army’s achievements are highly creditable but can no longer remain the only domain of focused strategic communication. The continuity factor in a hybrid conflict environment has to be taken into consideration. Personnel management practices cannot override national needs and the best talent must be made available to fight the enemies of the state. It’s only then that the campaign becomes comprehensive. Challenges in Kashmir ranges from increasing radicalisation among the youths, usage of new modes of resistance like social media, traditional approach of security establishment to deal with issues at hand to issues related with military deployment. Discuss. 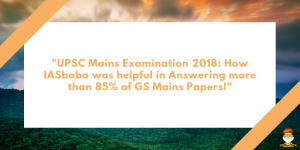 UPSC Civil Services Examination-IASbaba's All India Prelims Test Series 2018 General Studies and CSAT in English & Hindi- FULL PLAN!